In a tall glass with back of a spoon or muddler crush mint and basil with sugar and lime juice until sugar is dissolved and stir in rum. Add ice cubes and top off the drink with club soda or seltzer water. Put sugar snap peas in a single layer on a baking sheet covered in aluminum foil. Coat peas with olive oil. Sprinkle garlic, thyme, and salt on peas and mix around so coated. 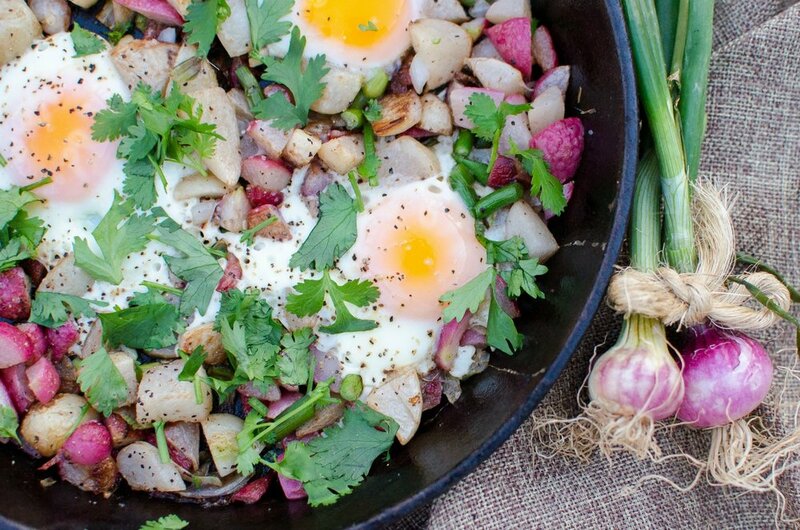 A hash of spring garden offerings like turnips, radishes, onions, and garlic scapes. Add in some fried eggs and you've got yourself a great breakfast! Add a tablespoon of salt to the water and toss in the chopped turnips and radishes. Boil them for about 4-5 minutes until they're tender and then drain off the water. Add half of the butter to a cast iron skillet and then saute the radishes and turnips for about 5 minutes. Add the garlic and onions, a sprinkling of salt and pepper, and continue to saute for another 5 minutes until the roots turn brown and crisp. Put the rest of the butter in the skillet and make 3 wells in the vegetables and crack an egg into each well. Sprinkle the eggs with salt and pepper and cook them until the whites are set and the yolk is to your desired doneness. Garnish with parsley, salt, and pepper. Bring the apple cider vinegar, water, salt, and sugar to a boil, stirring until the salt and sugar are dissolved. Carefully pour the boiling brine over the garlic scapes. The garlic scapes will probably pop up and look like they are trying to get out of the jar. Use a sterile chopstick or butter knife to push it back into the jar. Wipe the rims of the jars, then fix the lid tightly into place. Let the jars come to room temperature before storing in the refrigerator for 6 weeks before opening and tasting. Be patient. It’s worth it! The pickled garlic scapes will store well for up to 8 months when stored tightly covered in the refrigerator. Strawberry Rhubarb Jam is a classic combination - and delicious on everything from plain buttered toast to spread across a scrumptious muffin. This recipe does not use pectin. In a large pot over medium heat, add strawberries, rhubarb, water, and lemon and bring to a boil. Reduce heat the medium-low and simmer for 5 minutes, stirring occasionally. Add sugar and continue stirring occasionally, until jam has thickened - about 10-15 minutes (how to test the jam for doneness). Skim off any foam that's formed on the surface and discard. Divide the jam between 4 sterilized half-pint mason jars. Wipe down rims with a clean cloth, then screw on lids until they're finger-tight. Remove jars from the water bath and let cool. Any lids that don't dip down in the middle, or that spring back, have not sealed. Place those jars in the refrigerator and enjoy them first. All other sealed jars may be stored in a dark, dry place for up to one year. Recipe yields approx 4 half-pints (8oz) jars of jam. This recipe does not use pectin. The lemon zest and juice acts as a natural pectin to thicken this jam. Don’t chop kale: rip off the big stems and then rip handfuls of leaves into a bowl. Crunch it with your hands with some sprinkles of salt. Put dressing ingredients in a jar with lid, shake. Dress salad 5 minutes before serving. 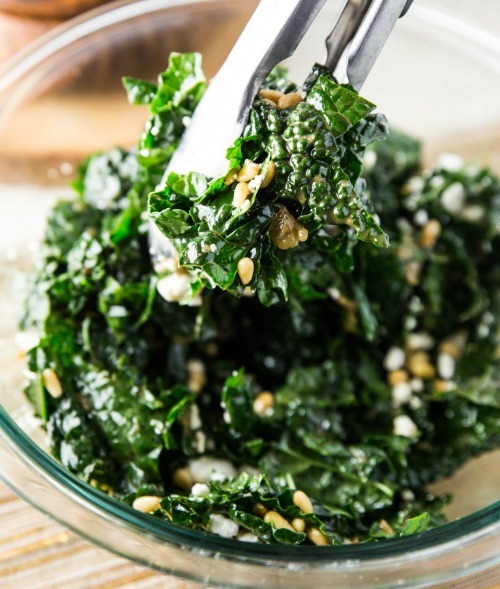 The acid in dressing facilitates wilting, which makes kale more palatable. Add strawberries, apples, nuts, seeds, cheese, etc. to make it more interesting. Note: dressing keeps well but salad does not. The recipe makes 2-4 servings.